Scrubbing vs. Power Washing – What is the Difference? We sometimes have requests from property owners and property managers to scrub a parking lot or garage instead of power washing it. So what is the difference? Scrubbing is usually performed with a specialized machine that uses water, soap, a brush (scrubber) and a vacuum to clean a surface. These scrubbers work great in interior applications and on polished concrete and in areas that are sensitive to water because the water is immediately vacuumed up after it is put down. 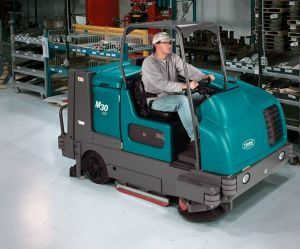 Below is an example of a floor scrubber. Power washing involves cleaning pavement with high pressure water. This is usually done with a hand-held wand or a walk behind surface cleaner. Our power washing units also have a hot water feature that make the cleaning more effective. With power washing, the area washed must either have good drainage or we must corral the water and vacuum it with with specialize machinery. Below are examples of power washing methods. Look at the difference we can make! So Which Method is More Effective? Of course the answer is “it depends.” Floor scrubbing is great for cleaning interior floors and polished concrete and areas where there is equipment or drywall walls that are sensitive to standing water. 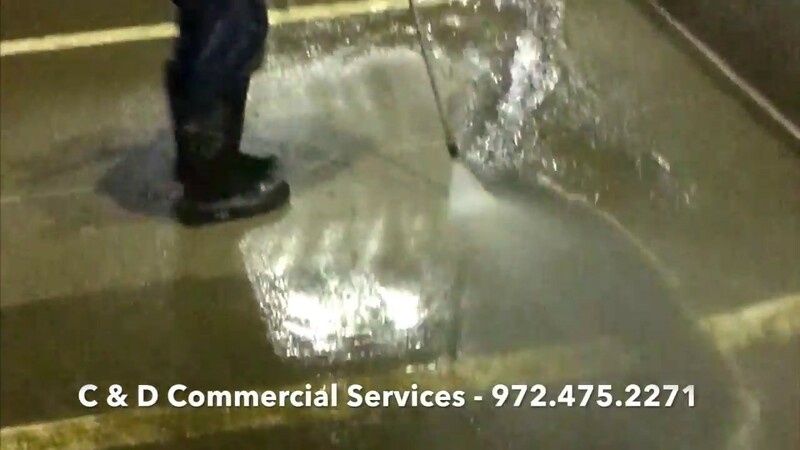 We have been cleaning parking lots and garages since 1981 and have gone through many power washing units and scrubbers over the decades and we have found that for parking lots and parking garages, power washing is much more effective at cleaning the concrete. The floor scrubbers tend to leave a trail of dirt and mud behind them on an unfinished surface. They also will only remove loose debris that is stuck to the surface and won’t clean into the pore spaces and won’t lighten up the color of the concrete. Power washing gets down into the pore spaces of the concrete and lifts the dirt, oil and debris out. 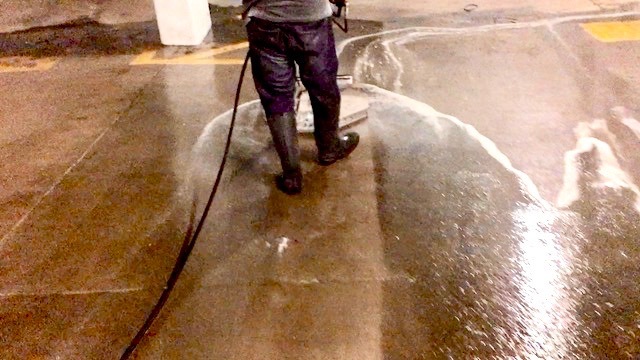 So while we get requests to have a parking garage scrubbed, we usually recommend power washing. There are a lot of power washing companies out there because anyone can go to Home Depot, buy a small power washing machine and put up a website. A quick internet search will pull up dozens in your area. However, not all power washing companies are the same. First, there is some skill involved in effectively power washing a garage. Each stroke of the power washing wand lightens the concrete so if the washer is not careful or experienced they will not cover the surface evenly, resulting in wand marks or swirl marks if a surface cleaner is used. We see these all the time when properties hire a cheap power washer or try to do the work in house. The power washing nozzle size and type must also be matched up correctly with the PSI and GPM of the machine and have the correct spray angle for the particular application. There are charts for this that must be adhered to. Second, not all power washing units are made the same. Most of these small and cheap power washing companies you find on the internet are using machines from their local hardware store. These machines are designed for residential use and will not be effectively on a parking lot or garage. Commercial power washing units have pressure as high as 4,000 psi and a volume up to 7 gallons per minute or more. When cleaning a parking lot or parking garage, the volume of the power washing unit is the most important factor in cleaning effectively. It’s like washing dishes in the sink, it take a lot longer to wash when you have the faucet turned halfway on vs all the way on. Likewise with a pressure washer, it takes much longer and is much more difficult when there is a low volume of water going through the machine. Many companies may say they can wash at 3,000 psi or more (you can get these machines at Home Depot) but their volume will be 3 gallons per minute or less. It is worth the extra cost to hire a company who is experienced in power washing a parking lot or garage and has the high pressure/high volume equipment to get the job done effectively.